I am currently maintaining a lead in my league and I believe a large part of the results have been my adoption of your strategy and the utilization of BABS. I love the thought process. It had never in all these seasons occurred to me to see the patterns as the way they were alike. I had always looked for differences. Revolutionary thinking on your part. I used BABS in most of my drafts this season, and so far so good on those teams. It was easy to use once I got the hang of it. The BABS project changed my view on all projection analysis. Thanks. I always appreciate the depth of analysis, whether or not it relates directly to my league because, well, baseball nerd. Thanks! Since I bought in with your ideas, I’m learning a whole new way to look at fantasy. Although I think the 10 day DL has put a skewed twist on things. I found it hard to believe when you said 60% of players didn’t meet projections. But, I’m becoming more of a believer all the time. Well worth, the cost of signing up. Love this stuff. First year to seeing it and even sitting at 6th in a league of 12 (dynasty 10 keepers, (C,1B,2B,SS,3B,CI,MI, 4OF, 3UTIL, 9P, 5BN, 4N/A, 5DL) daily player management, head to head) I still feel in control as I watch BABS come to fruition. Definitely the appropriate way to view a season as a whole. Great info, I have won or cashed a Check in every league I am in (5) since I have gone to the yearly HQ seminars. Now that Ron has left Baseball HQ anything that he has his name on, for me is MUST have Information for Fantasy Baseball. I love BABS. I love the Forecaster and I wish I found Ron Shandler 20 years ago. I’ve bought into the system enough to have drafted with it (though at least partially because my projections/ranking spreadsheet looked wonky this year and I didn’t have time to fix it before the draft) and am in 1st or 2nd place in my league so far. Let’s see how the system works. Really like the innovative thoughts. Most erudite, innovative fantasy site around. Keep up the great work! Not just a good way to look at fantasy, has also deepened my appreciation for baseball generally. I have been participating in fantasy baseball for 30 years. 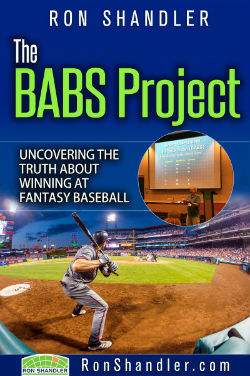 The BABS Project is definitely a breath of fresh air in the glut of data sabermetrics. I feel it leads to much better decisions on draft day. Thanks for creating the leading edge in fantasy baseball. Enjoy your articles. Your folksy writing style contributes a lot to my enjoyment of the pieces. I think Ron has created a monster (a good one). BABSzilla is out of control and destroying all opponents in her path! I’ve followed you since the early 90’s and applaud the continued evolution. As a Scoresheet player in a very deep keeper league I find BABS concepts helpful but the tools limited. I used the BABS methodology this year and it has exceeded my expectations! In particular, separating the liabilities really helped me to focus on mitigating risk particularly with injuries. Longtime fan of Ron’s work at BHQ and I testify that his FB still has plenty of velo to get the job done. Thanks for what you do. I love your writing, insight. I like how active you are in the forums. Most fantasy touts drive me nuts. The DFS ones are even worse (a lot). Fan of the Forecaster, fan of the website. You buy the world you want to live in. Happy to pay for both. Just want to express my gratitude for what you have done. First with BHQ and now with this site. There haven’t been many sources for information that have truly focused on the stats and have been around as long as you have. I’m not sure I would still be playing Scoresheet, and now Roto without constant access to BHQ & now BABS. Thank you! I’ve really enjoyed the site and the experience drafting with the BABS database this year. I’m in third place in my league so far, and overall pretty happy with my team. I’ve been doing fantasy baseball now for 5 years. And I have to say ever since I subscribed to ronshandler.com and got hooked on BABS my whole baseball experience has been awesome. It’s a much simpler way to process all that sabermetric chaos. Now all I need to know is asset groups and which categories I’m lacking in and BABS does the rest. Terrific website, on which I depend for analysis, education, and entertainment. I enjoy the site, the content, and especially Ron’s insight and perspective on fantasy baseball. I think Ron’s site is excellent and is one of my go-to sites for any question I have about fantasy baseball. I have found the BABS concepts completely useful and applicable. It’s a step up from tiering, which has always been my preferred drafting method. Did I leave off the part about Shandler walking on water? Ron, without question, BABS (and you) have made this my most enjoyable fantasy year ever, and I’ve been at it for more than 20 years. It’s wonderful being liberated from projections, and decisions based on those projections, that on the whole have no chance of being accurate. BABS is so much more intuitive to me, and easy to use (even for an old-schooler like me). Thanks so much for your hard work and for the care and dedication you give to your subscribers. Where do I find 2019 projections, first time user..
We do not publish traditional projections. Read up about the BABS system to learn about the player ratings and rankings. The BABS ratings don’t correlate directly with traditional gauges. They are skills-based that can be considered leading indicators to RANGES in traditional stats. You don’t need the stats themselves – they are only measurement devices AFTER THE FACT. Again, all explained in detail in the eBook. Been a fringe BABS guy for while, just never fully bought in. This year I am going full BABS in a keeper league that I’ve had some dreadful finishes in and this offseason has been the most enjoyable. Instead of looking through insane detail trying to figure out small differences now I can comfortably sift through players and target buy low guys with similar profiles and much less risk as high end keepers. Turned Seager, Ozuna and Olson into Carpenter, Segura, and Greinke. Lets see how this play out over a full season.